Two weeks after I arrived at King Abdullah University of Science and Technology (KAUST) as an Assistant Professor, in November 2014, I learned about mushroom-shaped or doubly reentrant microtextures from Liu & Kim’s report in Science1. This approach was inspired by the recent work of Hensel, Werner, and Neinhuis on mimicking the skins of springtails - common bugs living in moist soils2,3. The authors reporting in Science demonstrated that by carving pristine arrays of hair-thin doubly reentrant pillars (DRPs) spaced 0.1 mm apart, ANY material could be turned “super-repellent” (or superomniphobic) to liquids—water, oil, whatever1. Those amazing results from coating-free surfaces seemed to defy conventional wisdom - surface roughness renders intrinsically wetting surfaces even more wetting. I was intrigued! It is important to clarify that solid surfaces in the coating-free approaches to omniphobicity are intrinsically wetting. Thus, at the thermodynamic equilibrium, the liquid completely fills the microtexture, and the key is to trap the system in metastable states for the longest time4. I asked the first recruits in the Group, Mr. Sankara Arunachalam and Dr. Eddy Domingues, to experimentally confirm if those results were true. Coincidently, a KAUST colleague was able to provide us with silica surfaces adorned with DRPs, which he was performing underwater force-spectroscopy on with air bubbles. We immediately started playing with those samples in our laboratory! Sankara confirmed that the DRP-based surfaces were indeed super-repellent to liquids - even those with low surface tensions, such as ethanol and methanol. However, he also discovered that the super-repellence was lost instantaneously if (i) the liquid touched the boundary of the DRP microtexture, or (ii) in the case of water if the environment was overly humid. Specifically, if the liquid ‘touched’ the stems of the pillars through the boundary or due to the presence of thick condensed films, the microtexture would imbibe the liquid (Figure 1A). We, thus, realized that the scope of this breakthrough was limited for applications requiring immersion. During one of our brainstorming sessions, we came up with the idea to ‘invert’ the pillars-based microtexture to cavities, such that the entrapped air would now be distributed in thousands of tiny compartments (Figure 1B). To this end, Eddy and Sankara learnt photolithography and dry etching techniques, and microfabricated silica surfaces with arrays of square doubly reentrant cavities (DRCs) in about six months, building upon the recipes from the original report. This was an intense phase of trial and error, leading to exciting results. Indeed, DRCs did not lose omniphobicity catastrophically on immersion6. We also demonstrated that, unlike DRPs, DRCs did not suffer a catastrophic loss of omniphobicity due to localized defects, the dings and scratches that real-world surfaces inevitably accrue. 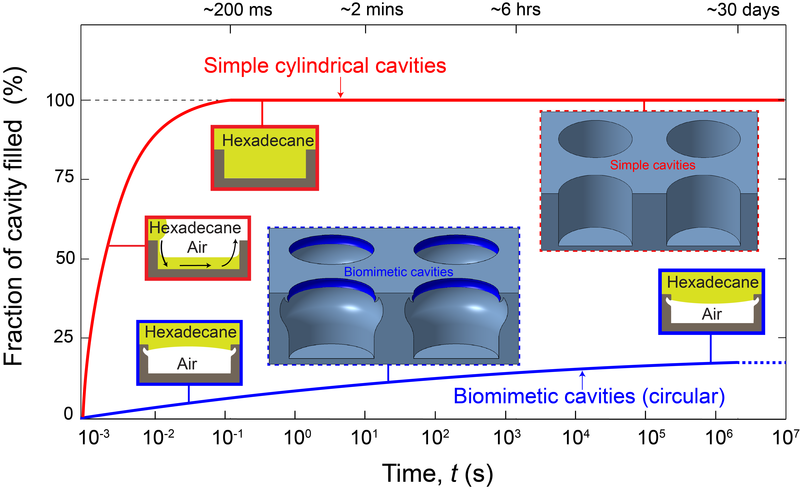 While the robust entrapment of air in biomimetic cavities could underlie a coating-free approach to drag reduction, a series of questions remained, such as what should be the ideal shape of the cavities for the robust entrapment of air; is the presence of corners useful or harmful; and how do the properties of liquids influence the stability of the trapped air, etc. To address those questions systematically, we investigated silica surfaces with biomimetic DRCs, RCs, and simple cavities of circular, square, and hexagonal shapes; to investigate the corner-effects, we studied square and hexagonal cavities with sharp and rounded corners. Indeed, the biomimetic textures had dramatic effects. For instance, in comparison to simple cylindrical cavities that got filled on immersion in hexadecane within < 1 s, circular reentrant and doubly reentrant cavities trapped air that remained intact even after 10,000,000 s, after which the experiment was discontinued (Figure 2). We also found that even though the square and hexagonal arrays of DRCs and RCs could entrap more air than circular ones for a given surface area, the non-circular cavities got filled much quicker; the underlying reasons are not entirely clear. Same trends were observed for the robustness of the cavities against penetration of liquids under external pressure (breakthrough pressures). While dealing with liquids of higher vapor pressure, we found that even though they did not penetrate the cavities on immersion, the condensation of vapor inside the cavities over time destabilized the system. Based on our experiments with fifteen types of microtextures with multiple experimental techniques and liquids, we proposed design criteria for the robust entrapment of air on immersion. We are currently investigating the role of surface chemistry on capillary condensation along with exploring strategies to preempt it. Our findings also underscored the importance of 'immersion' as a crucial criterion for the assessment of omniphobicity of surfaces, which contact angles might fail to capture7. To learn more about our work, please read our article “Biomimetic coating-free surfaces for long-term entrapment of air under wetting liquids” in Nature Communications5. 1 Liu, T. Y. & Kim, C. J. Turning a surface superrepellent even to completely wetting liquids. Science 346, 1096-1100, doi: 10.1126/Science.1254787 (2014). 2 Hensel, R. et al. Wetting Resistance at Its Topographical Limit: The Benefit of Mushroom and Serif T Structures. Langmuir 29, 1100-1112, doi:10.1021/la304179b (2013). 3 Hensel, R., Neinhuis, C. & Werner, C. The springtail cuticle as a blueprint for omniphobic surfaces. Chemical Society Reviews 45, 323-341, doi:10.1039/c5cs00438a (2016). 4 Kaufman, Y. et al. Simple-to-Apply Wetting Model to Predict Thermodynamically Stable and Metastable Contact Angles on Textured/Rough/Patterned Surfaces. The Journal of Physical Chemistry C 121, 5642-5656, doi:10.1021/acs.jpcc.7b00003 (2017). 5 Domingues, E. M., Arunachalam, S., Nauruzbayeva, J. & Mishra, H. Biomimetic coating-free surfaces for long-term entrapment of air under wetting liquids. Nature Communications 9, 3606, doi:10.1038/s41467-018-05895-x (2018). 6 Domingues, E. M., Arunachalam, S. & Mishra, H. Doubly Reentrant Cavities Prevent Catastrophic Wetting Transitions on Intrinsically Wetting Surfaces. ACS Applied Materials & Interfaces 9, 21532-21538, doi:10.1021/acsami.7603526 (2017). 7 Arunachalam, S., Das, R., Nauruzbayeva, J., Domingues, E. M. & Mishra, H. Assessing omniphobicity by immersion. J. Colloid Interface Sci., doi:10.1016/j.jcis.2018.08.059 (2018).